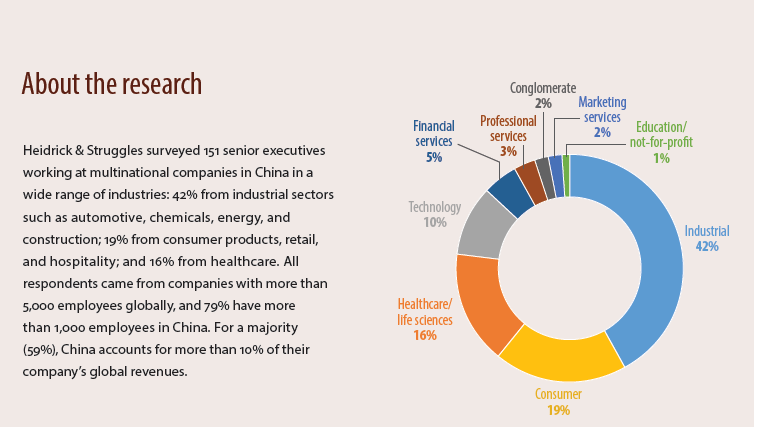 Heidrick & Struggles China recently conducted a survey of 151 senior executives at director level or above in mainland China to understand how extensively employer branding affects corporate success, and the factors that attract them to and retain them at an organization. When asked to pick the three most crucial factors that make an organization a good place to work, respondents name ‘high quality of senior leadership’ (57%) and ‘attractive corporate culture’ (52%) higher than ‘a competitive employment offer in terms of salary and benefits’ (49%). Yet, good company brand and reputation, clear personal development and promotion path are seen as less important factors when it comes to the pull factors. When asked what attracts them to a company, over 90 percent of the executives in the survey say that having senior leaders who are charismatic, inspiring, credible spokespeople is very important to their decision in joining a company. This aligns with the trend of ‘CEOs as celebrities’, with high-profile, charismatic executives such as Alibaba’s Jack Ma and Baidu’s Robin Li becoming synonymous with their company’s image, and inspiring employees and customers alike. When it comes to retention, the most important leadership qualities that encourage employees to stay are that senior leaders trust their staff, have a high level of transparency, and foster two-way communication between management and employees. According to the study, when asked to pick the three most important factors for a company’s structure and business model, recognition of high achievers (99%), a friendly and collaborative working environment (93%), and respect and encouragement for diverse thinking and new ideas (91%) are the key building blocks constituting a compelling corporate culture. These results are similar to those in the Asia Pacific Consumer Markets Report 2015 – a previous Heidrick & Struggles employer branding survey of senior executives across the Asia Pacific region – where 98 percent of respondents said that diversity of thinking in the workplace is the most important characteristic, while recognition of high achievers was in second place at 97 percent. Roughly 31 percent of executives surveyed say they are currently looking for new job opportunities and hope to leave within 12 to 18 months; an additional 29 percent say they may leave within the next two years if better opportunities are available. This finding suggests that employees in China may have less patience with a suboptimal status quo at work than employees elsewhere in Asia. In the previous Asia Pacific survey, just 30 percent said they were considering leaving their employers, and only just over half of this group hoped to make a move within 18 months. About the author: Heidrick & Struggles (NASDAQ: HSII) serves the executive talent and leadership needs of the world’s top organizations as a premier provider of leadership consulting, culture-shaping and senior-level executive search services. Heidrick & Struggles pioneered the profession of executive search more than 60 years ago. Today, the firm serves as a trusted advisor, providing integrated leadership solutions and helping its clients change the world, one leadership team at a time.